You’ve got a plan for your firm’s growth. You’ve set out achievable milestones for both the near and distant future. Your goals are definitely within the realm of the possible… but nothing’s coming together. Outsourcing accounting work can help you get your firm back on track. No talent trained in the new services you want to offer. You can’t afford to bring new in-house talent in. You don’t know which software to try and you certainly don’t want to spend the money it would take to try them all out. You don’t have the space for new talent in your current location, and it’s going to cost a bundle to relocate and pay at new rent levels. You can’t locate where your work flow is slowing down; or if you can, you can’t afford to do much about it. We’re sure there are more items you could add to your own personal list of doom. But we’re equally sure that outsourcing accounting work can erase some of those ticks from your list. Let’s take a look at some of those items on that list. You don’t have enough talent – Easily solved by outsourcing accounting work. 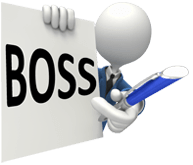 Through BOSS you have a deep, well-trained talent pool that is already up to speed on all Australian tax procedures. And that pool is flexible – you use the people you need meaning you’re not paying for underutilized people to sit around and twiddle their thumbs, and your people don’t know the first thing about SMSF procedures. It’s going to take money to hire new people in. Or to train up your current staff. And if you choose the latter, that means that while they’re training they’re not spending time on current accounts. By outsourcing accounting work you have access to people already trained on any sort of accounting work you could want, no matter which way you want to stretch your firm’s reach. You can’t afford to hire new people in – Sometimes hiring new in-house talent is just plain too expensive. It’s not just the cost of paying them wages and benefits – you’re also going to be ponying up for furniture, a computer plus its accessories, health care, and so on. Outsourcing accounting work frees you from overhead and benefits, leaving you with just the talent you need. You have software/tech concerns – There are a lot of accounting and workflow software packages out there. If you’re not a tech person, it gets overwhelming fast. Your virtual workers have experience on a wide range of software packages. They can give you advice on what software package would suit you best or how best to set up a workflow to keep the tax info flowing back and forth as efficiently as possible. You’ll have to rent bigger quarters – Not a problem when you’re outsourcing accounting work. You’re having trouble with workflow blockages – This is the one item you need to sort out yourself but we recommend you read this. What we suggest is that you set up defined processes with built-in milestones that will help you narrow down where you’re having problems. Once you are able to define your blockages, you’ll then be able to route your time, energy, and money to the parts of your process that require the most care. Chances are that outsourcing accounting work is going to be both the most efficient and the most-cost effective solution in helping you smooth things out.